When you think of external storage, you probably think of clumsy USB hard drives and finicky network shares. But with Thunderbolt 3 cables capable of theoretical transfer rates of up to 40Gbps, external solutions now offer some exciting benefits without a significant transfer rate bottleneck. If you combine blazing-fast transfer speeds with the benefits of a RAID system, it gets even more exciting. Though these enclosures are pricey, they’re becoming more affordable with options for every budget. So let’s take a look at Thunderbolt RAID enclosures, and how they can supercharge your external storage. RAID stands for Redundant Array of Independent Disks (though it originally stood for Redundant Array of Inexpensive Disks). The clue’s in the name, but a RAID system (or “array” as they are known) involves using multiple hard drives within a single storage system. There are number reasons you might want to do this. RAID systems are designed to deliver higher performance, increased redundancy in case of data loss Things You Should Know About Redundancy and Backups Things You Should Know About Redundancy and Backups Redundancy is frequently confused with backups. Indeed, the concepts are relatively similar, albeit with some important differences. Read More , better drive availability, and to facilitate the addition of more storage in future. Each implementation, or level, has a corresponding number. These levels strike different balances between performance, redundancy, capacity, and availability. Two of the most-used RAID levels are RAID 0 and RAID 1, with variations known as “nested” or “hybrid” RAID systems based on both of them. RAID 0 uses all drives in an array to create a single logical volume. This enables increased write speed, since the system can write data to both volumes at the same time. RAID uses a system known as “striping” to store data in sequence on separate volumes. The downside is that if one hard drive fails, the whole array fails. RAID 1 is all about redundancy. This uses an even number of drives to mirror all data. Two 1 terabyte hard drives in RAID 1 would give you an effective volume of 1TB. If one drive were to fail, all your data would be safe since it was mirrored onto a second drive. This offers little speed benefit to the user in favor of redundancy. There are other levels, including nested RAID arrays like RAID 0+1. This creates two RAID 0 arrays, and mirrors them in RAID 1. You’ll get the speed boost of a two-drive RAID 0 system and some of the redundancy of a two-drive RAID 1 system. Read more about RAID and its most common implementations How to Configure a RAID HDD Array in Linux How to Configure a RAID HDD Array in Linux Got spare hard disk drives that you want to use more efficiently with your Linux computer? You can with RAID, a system that can provide a performance boost, or add redundancy. Read More . Why Thunderbolt for RAID Systems? Thunderbolt 3 can, given the right cable and conditions, deliver data transfer speeds of 40Gbps. At maximum theoretical write speeds, that’s 5GB per second. By comparison, USB 3.1 Gen 2 can do a maximum of 10Gbps, or 1.25GB per second. This possible because Thunderbolt cables use active circuitry, whereas USB standards are passive. Thunderbolt 3 is backwards compatible with previous standards too. Thunderbolt 2 delivered a 20Gbps throughput, while the original standard enabled 10Gbps per channel (with the ability to use two channels). This is why Thunderbolt is preferable to even the latest USB 3.1 Gen 2 standard. Apple replaced FireWire with Thunderbolt Making Sense of USB-C and Thunderbolt Cables and Ports on Your MacBook Making Sense of USB-C and Thunderbolt Cables and Ports on Your MacBook Wondering what USB-C and Thunderbolt are, and how these types of cables affect your MacBook? Here's everything you need to know about your MacBook ports. Read More and has championed the interface over the last decade. This culminated in a MacBook Pro that ships with only four Thunderbolt 3 ports. Thunderbolt was co-designed by Intel and Apple, but it’s not only Apple users who can take advantage of the standard. Devices sporting Thunderbolt 3-capable USB-C ports have been on the market since late 2015. 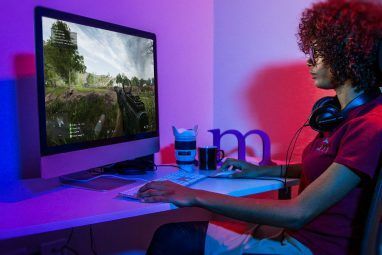 It’s not just MacBooks and Apple hardware either: Asus, HP, Dell, Alienware, Lenovo, and MSI are just a few of the PC manufacturers that have embraced the format. In May 2017, Intel announced that Thunderbolt 3 would become royalty-free for manufacturers to implement into their hardware. It’s now easier and cheaper than ever for both computer and peripheral manufacturers to implement Thunderbolt, and that’s great news for transfer speeds. Implementing RAID arrays was once something you’d need to take care of inside your PC case. Now there are dedicated RAID controllers for virtually any budget. You can buy them naked, with no drives, or stuffed with terabytes of storage. Starting at $600 for 8TB, G-Technology’s G-RAID array delivers a transfer rate of up to 500MB per second in RAID 0. It’s a strictly two-drive affair that scales to 12TB, 16TB, 20TB, and 24TB capacities. You get two Thunderbolt 3 ports, a single USB 3.1 Gen 2 port, and HDMI out (with HDCP 2.2 capable of 4K/60p playback). AKiTiO produce a number of Thunderbolt enclosures for all kinds of purposes, including several RAID solutions. The Thunder3 RAID Station is just one of them, capable of housing two 2.5-inch or 3.5-inch SATA drives. The Thunder3 includes an enclosure-only option, so you can source and install your own drives (don’t worry, it’s easy). There’s no HDMI out, but you do get a UHS-II compliant SD card reader, a fan-off toggle, an Ethernet port, and dual USB and Thunderbolt ports. You can also opt for the Thunder 3 Quad, which can house four drives. If you need to store a lot of data in a neat, transportable package, then consider the four-bay G-SPEED Shuttle. Starting at $1,800 for 16TB, the Shuttle is also available in 24TB, 32TB, and 48TB configurations. There’s no HDMI-out, but G-Technology promises a read speed of 1000MB per second with the right configuration. Named due to its inclusion of Thunderbolt 3, the Pegasus3 series from PROMISE comes in four, six, and eight drive bay configurations. The basic model offers 12TB or 16TB of storage (4x3TB or 4x4TB), dual Thunderbolt 3 ports, and even comes with a high-speed cable to get you started. 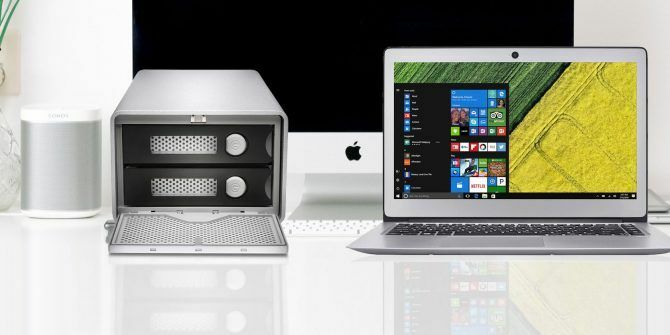 At the top end of the scale, the Pegasus3 eight-bay enclosure can house up to 80TB and is available in 48TB, 64TB, and 80TB—but it’s expensive and will cost you more than an iMac Pro. Stylish external storage specialist LaCie also produces Thunderbolt 3 RAID arrays, starting with the dual-bay 8TB version. This model comes with a DisplayPort out with support for 4K playback, a USB 3.0 hub, and SD/CF card slots for quick transfer. It also comes with a month’s free access to Adobe CC. You can buy the 2big enclosure in 8TB, 12TB, 16TB, and 20TB versions. LaCie also produces 4big, 6big, and 12big Thunderbolt 3 RAID enclosures with four, six, and twelve drive bays for up to 120TB of storage. RAID enclosures offer some serious benefits over traditional hard drives. Whether you want peace of mind or pure performance, you can’t really beat what RAID enclosures offer. But if you’re tight on cash, you might have to settle for something else. Many manufacturers create drive-less arrays (like the AKiTiO above), which you can fill with your own drives (or source them on sale at a later time). This allows you to stagger the initial cost of your RAID investment, without having to sacrifice speed or (in the long term) capacity. Just make sure to buy an enclosure with enough drive bays in it! Next, you might want to consider looking at Thunderbolt 2 RAID enclosures. Since Thunderbolt 3 is only a few years old, there’s plenty of old Thunderbolt 2 stock hanging around. Pretty much all the arrays listed above come in Thunderbolt 2 versions, with theoretical data transfer rates of up to 20Gb/sec. These enclosures offer an interface that’s half as fast, and lack modern pleasantries like USB 3.1 Gen 2 and UHS-II card readers. Regardless, Thunderbolt 2 is still a fast standard. Where possible, for future compatibility, you should always go for the fastest interface you can afford. You can add storage locally using external hard drives, replacing your internal drive with a larger one, or using a memory card if you’re a MacBook owner. None of these solutions match a RAID array for speed or redundancy, but they’ll also cost you significantly less. One final alternative is network-attached storage (NAS). Network speeds are the obvious bottleneck here, especially for wireless devices. Check out our favorite NAS drives The 4 Best NAS for Home Media Servers and Shared Storage The 4 Best NAS for Home Media Servers and Shared Storage We tell you what to look for in a NAS to get the best media server and recommend a handful of the best NAS devices to get you started. Read More , or better still, convert an old computer and build your own. For streaming media over a network, or making periodic backups, NAS drives are ideal. Explore more about: NAS, RAID, Storage, Thunderbolt.